The Ohio Valley Symphony will soon be bringing back holiday favorites. GALLIPOLIS — Baby, It’s Cold Outside is not just a weather advisory, it’s one of the songs The Ohio Valley Symphony will play on the December 1 concert at the Ariel Opera House. Under the direction of Guest Conductor Steven Huang The Christmas Show will be a mix of holiday classics and songs of the season. The program, now a southeast Ohio tradition, is at 7:30 p.m. in the Ariel-Ann Carson Dater Performing Arts Centre in downtown Gallipolis, Ohio. Locally-based Holzer Health System is the long time sponsor of the evening’s festivities. The evening begins with a pre-concert chat at 6:45 p.m. led by Huang, director of Orchestras at Ohio University. Supporters say his casual style of presenting the background of the music played is entertaining, informative and fun. Traditional music such as Winter (from the Seasons) and the Pas de Deux from the Nutcracker will transition into more popular tunes such as Merry Christmas Darling, The Twelve Gifts of Christmas and Let it Go from “Frozen.” Mele Kalikimaka, made famous by Bing Crosby is also on the program. Vocalists Melissa Brobeck and Kelly Burns Ohio University colleagues of Maestro Huang, join the OVS for some of the popular songs of the season. Who will be the next Maestro for a Moment? 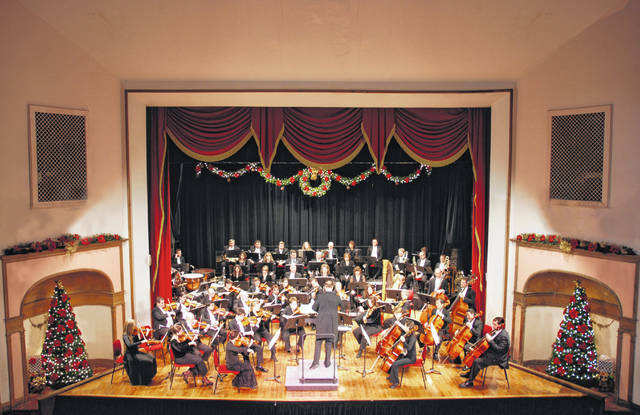 Gallia County Sheriff Matt Champlin and local physicians Brett Powell and Rajesh Rajan will be vying for the chance to conduct The Ohio Valley Symphony in Sleigh Ride by raising the most funds by intermission of the concert. Vote early and vote often by sending checks to OVS at PO Box 424 Gallipolis, Ohio or go to the website at arieltheatre.org and cast your monetary vote online. This annual fundraiser helps keep live music available for the region. The Ariel invites the public to come to a post-concert reception to meet the musicians, have punch and seasonal treats. The OVS has said it has a mission of bringing great music played by great artists to the Ohio Valley – and making orchestral music easy to love. To get a unique perspective on making music, the public is welcome to attend OVS rehearsals for free at 7-10 p.m. Friday, Nov. 30, and 1-4 p.m. Saturday, Dec. 1. Open rehearsals are a great way for young and old alike to become more familiar with symphonic music, and they offer a behind-the-scenes glimpse of what goes into preparing an orchestral performance. Funding for The Ohio Valley Symphony is provided in part by Holzer Health Systems, the Ann Carson Dater Endowment and you, the public. The Ariel is located at 426 Second Ave. in downtown Gallipolis, Ohio and is an ADA accessible facility. Other shows on The Ariel’s holiday concert calendar are Dec. 8, 2 p.m., Merry Tuba Christmas; Dec. 15, 3 p.m., Voices of Christmas.